DESCRIPTION OF THE BOOK: Fifteen-year-old Doris is used to taking care of herself. Her musician parents have always spent more time singing in nightclubs than watching after her. But when her ailing mother goes home to Puerto Rico to get well and pursue a singing career there, and her father finds a new girlfriend, Doris is more alone than she’s ever been. Disconnected from her family and her best friends, who are intertwined in terrifying relationships with a violent classmate, Doris finds refuge in taking care of homing pigeons on her apartment building’s roof. As Doris tries to make sense of it all, she learns that, just like the pigeons, she might have to fly far distances before she finds out where she belongs. 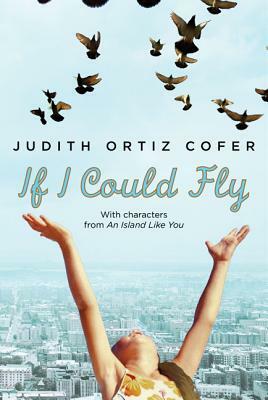 MY TWO CENTS: If I Could Fly is the sequel to Judith Ortiz Cofer’s award-winning YA short story collection An Island Like You. Readers of the first book will remember invisible-feeling Doris, her artistic friend Arturo, her self-described “dangerous” friend Yolanda, and her musician parents. The title comes from something her mother says when frustrated with her father: Si yo tuviera alas. Literally, if I had wings. Doris proves herself the worthy heroine of a novel. Her bewilderment and sorrow over her mother’s unexplained departure immediately makes her sympathetic. Her strength makes her admirable. Papi doesn’t know how to relate to her and is often busy managing two bands. Doris can deal with that, but what is less tolerable is when the singer who replaces Mami also ends up spending a lot of time in their apartment and tries to play mother. There are problems at school, too. Arturo is bullied by a member of the neighborhood gang. This escalates into two violent crimes committed by Doris’s classmates, but Ortiz Cofer doesn’t handle these in a preachy way. She seems to understand that troubled teenagers sometimes do stupid, even hateful, things and does not demonize the guilty parties. If one is looking for a lesson, readers can relate to having friends with problems. It is best to treat these friends with compassion, but also to remove yourself from dangerous situations. Between the drama at school and with her parents, the apartment rooftop is the one place where Doris can find peace. There she spends time with Doña Iris, an elderly woman who thinks Doris possesses facultades, or clairvoyance. Together they examine the shiny things that Martha, the lead pigeon, brings back to the coop. It is lovely to see how Doris relates to the much older woman, and the comfort they give each other. (Doris’s grandmother in Puerto Rico is another memorable, sassier, older woman character.) In the part titles, Ortiz Cofer uses quotes from Derek Goodwin’s book Pigeons and Doves of the World to describe bird behavior. City pigeons aren’t normally thought of as that interesting or beautiful, but this information makes you appreciate them in a new way and enriches Doris’s story with potent metaphors about home and flight. Doris is torn. Should she stay in New Jersey with her mostly absent father or go to Puerto Rico to live with Mami? And does Mami even want her? She has the chance to visit Puerto Rico and imagine a life there. What’s clear is that, with her parents living in different places, life is never going to be simple. Judith Ortiz Cofer writes an emotional, thought-provoking story about a girl grappling with the disintegration of her parents’ marriage, a strange but well-meaning potential stepparent, and her mother’s scary health issues. No less daunting is the fear that her mother is choosing her singing career over her. Amid the bad are bright spots, like a passionate drama teacher who urges Doris and her classmates to reimagine West Side Story. Embracing her creative abilities and imagination is what saves Doris, and this story will especially resonate with creative types who face similar obstacles. WHERE TO GET IT: To find If I Could Fly, check your local public library, your local bookstore, or IndieBound. Also, check out Goodreads, Amazon, and Barnes and Noble. ABOUT THE REVIEWER: Toni Margarita Plummer is a Macondo Fellow, a winner of the Miguel Mármol Prize, and the author of the story collection The Bolero of Andi Rowe. She hails from South El Monte, a working-class suburb of Los Angeles, and worked as an acquiring editor at a major publisher for more than ten years. Toni now freelance edits and lives in the Hudson Valley with her family. Visit her website at ToniMargaritaPlummer.Wordpress.com.